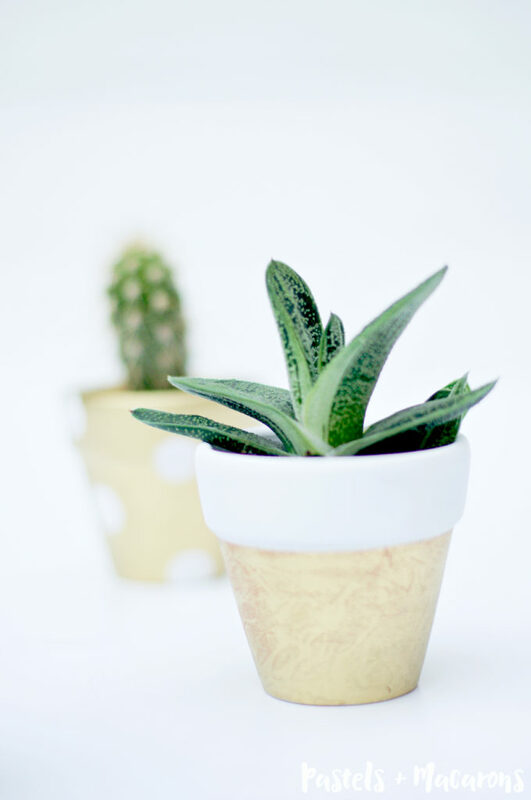 Today I’ve got a simple project that give any terra cotta pot the “wow” factor and adds very stylish and classy decor to any room in your home. I’m currently decorating my guest bedroom and gold seems to be a big hit for this bedroom right now. I’ve decided to use Autumn as inspiration for my guest room and so I naturally feel gold is a bit of a must. 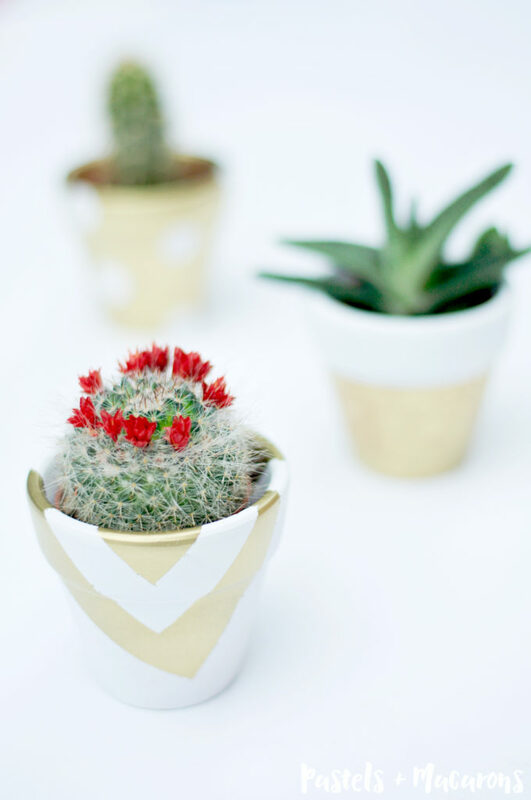 I’ve been going a bit gold crazy lately so I have to be careful not to over do it but these tiny terra cotta pots are just the right amount of gold touch my guest bedroom needs. When I set out to decorate the guest bedroom I had two main goals in mind; create a room that is warm and inviting and also give it a rustic, yet modern feel. It’s a fine balance as I want the room to flow and not clash in design. I set out to makeover some temporary bedside tables (while I hunt the internet and local stores for the “perfect bedside tables”). Then once I completed those I started to think about what extra touches I want to add to the room. I love using accessories to decorate a room. I’m currently a renter so I have to be really cautious with how much I can hang on walls and if I can paint any walls to give the room a different look, so I use pretty cushions and decorating items to bring my home to life. I wanted some cute little accessories on one of the bedside tables because all it has on it currently is a lamp. I wanted to add some plants to the room and I love cactuses lately. They’re adorable AND best part about them, minimal maintenance! Win! I’m all about minimal upkeep with two small toddlers running around the house I’m limited with time. 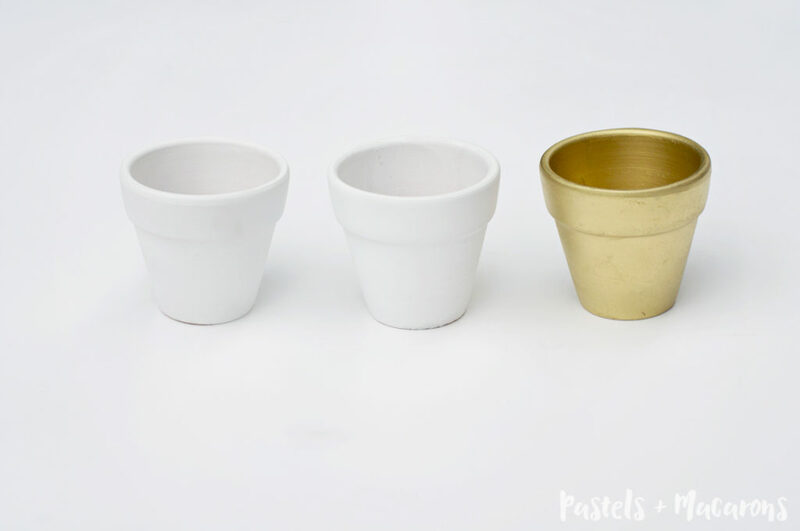 With all of this in mind I set out to create this quick and easy painted terra cotta pots project that took minimal time and effort. 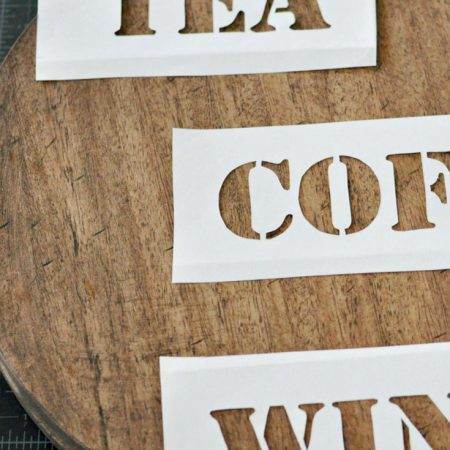 Something to spray paint on like an old sheet or large piece of card stock. Step 1. 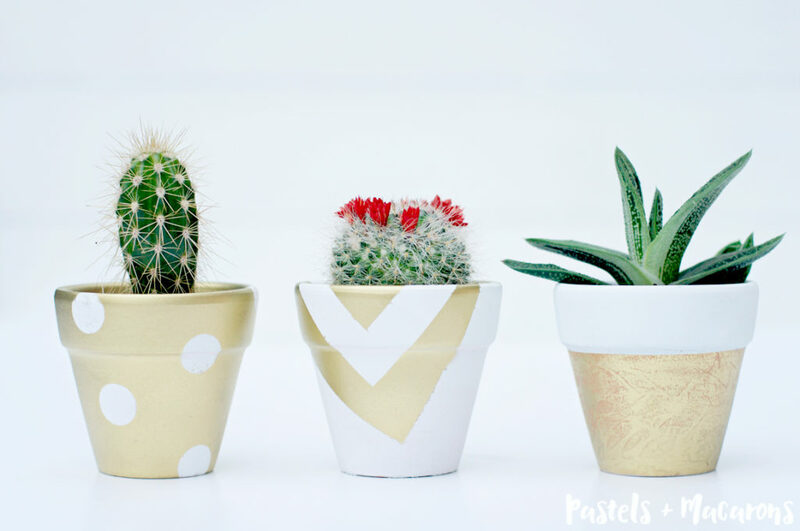 Begin by spray painting your pots. I painted two in white and one in gold as the base colors. Allow to dry. Step 2. 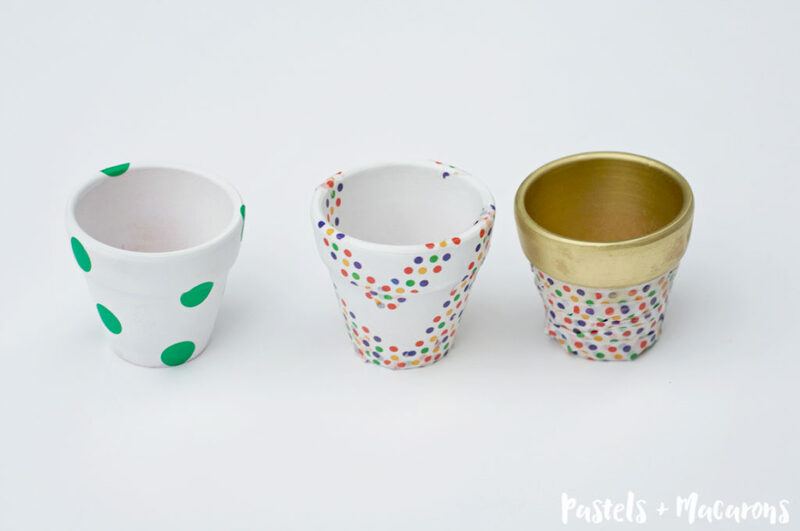 Place the washi tape or painters tape and dot stickers on your pots in the patterns you desire. I wanted one pot with dots, one with the top rim white and the body of the pot in gold and the third to have geometric lines. Step 3. 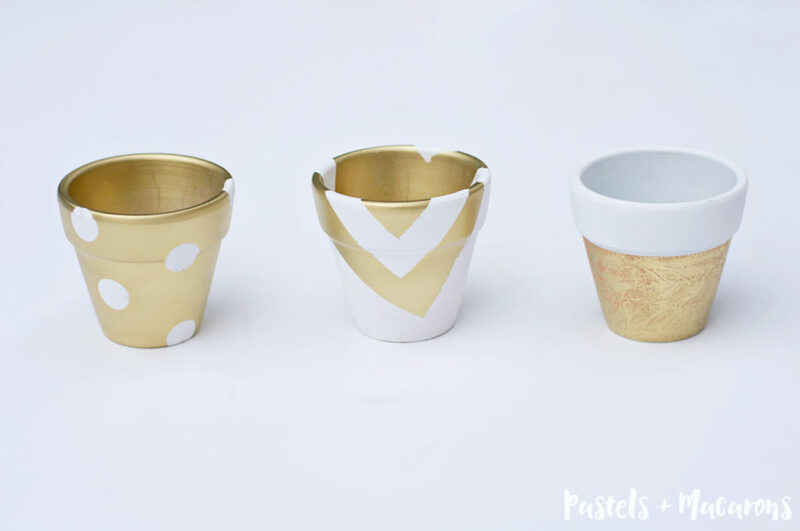 Continue by spray painting your pots over the tape and stickers you have just stuck onto your pots in the alternating colors you want on each pot. Allow to dry. Step 4. 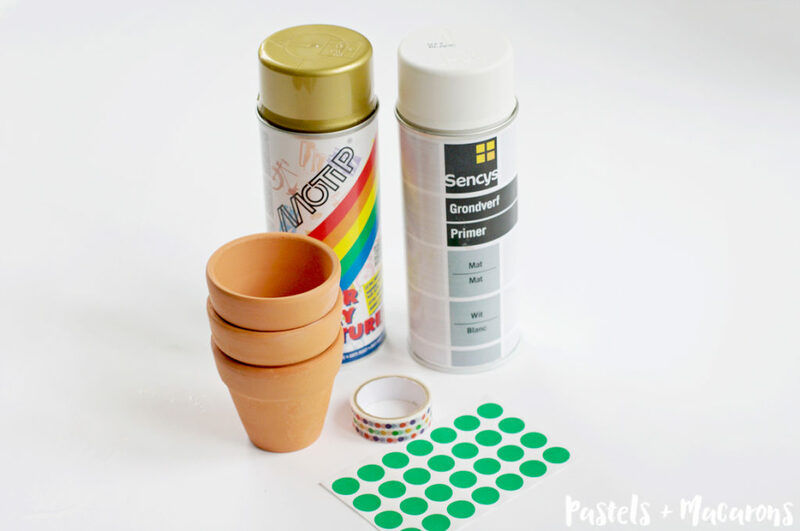 Gently peel off your stickers and washi tape or painters tape to expose your final patterns. I love this step so you can see the finished product. Step 5. Observe your creation! How pretty right!?! 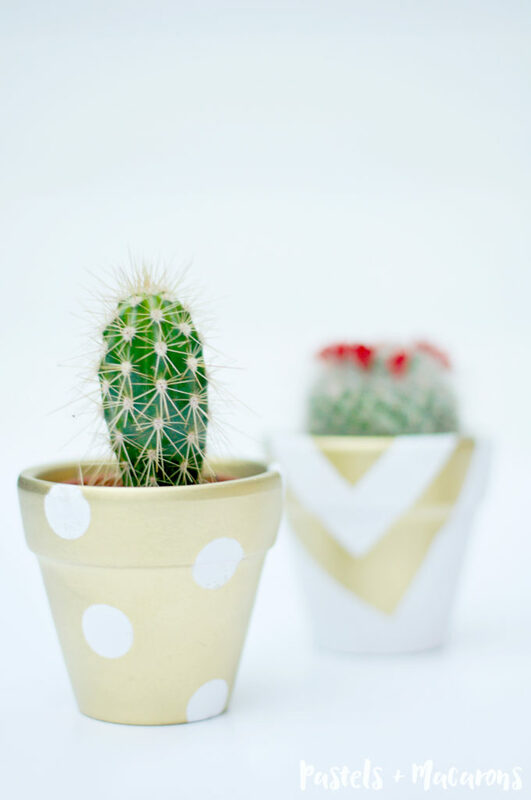 Now time to place your little cactuses into your pots and enjoy the prettiness you just created. Such simplicity, yet so elegantly feminine and pretty I think! I love my little pots. Very happy with how they turned out. Now if you’re wondering how I created the slightly sponged on gold paint look on on of the pots it was actually by accident. The gold paint of this pot was not completely dry (I was excited alright!) and so when I peeled off the washi tape this is what I had. I actually fell in love with the finish and decided not to fix my “mistake”. If you want this look then try doing the same as I did and don’t wait for it to completely dry or you can always go back with methylated spirits and sponge a little here and there until you get this look. So there you have it! 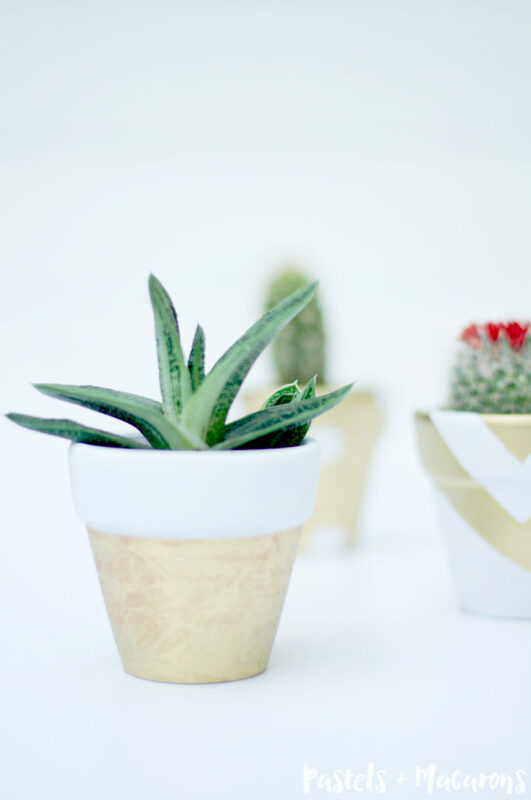 I hope you enjoy recreating my White And Gold Terra Painted Cotta Pots tutorial and fill your house up with lots of beautiful plants and cute painted pots. 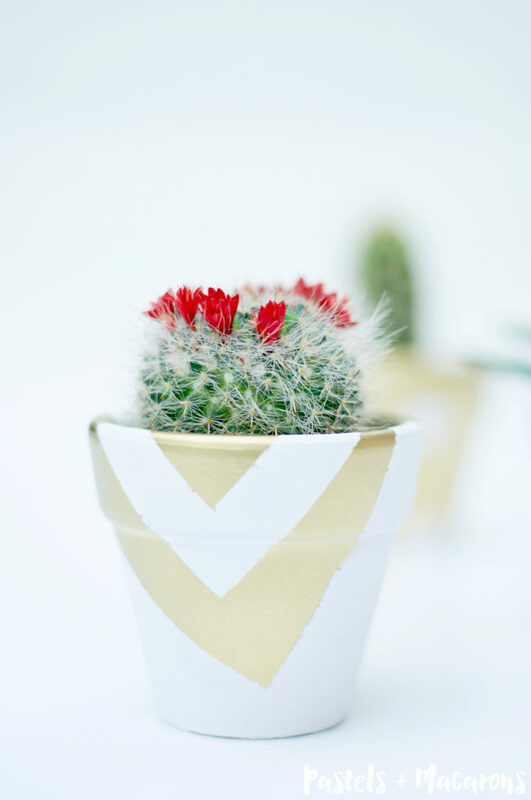 Have you painted terra cotta pots, or any type of pots before? How did you paint them? If you enjoyed this post then you may also enjoy some of my other DIY projects! I love these! They are so pretty! And I love how simple they are. I love that you used stickers and washi tape! So cute! 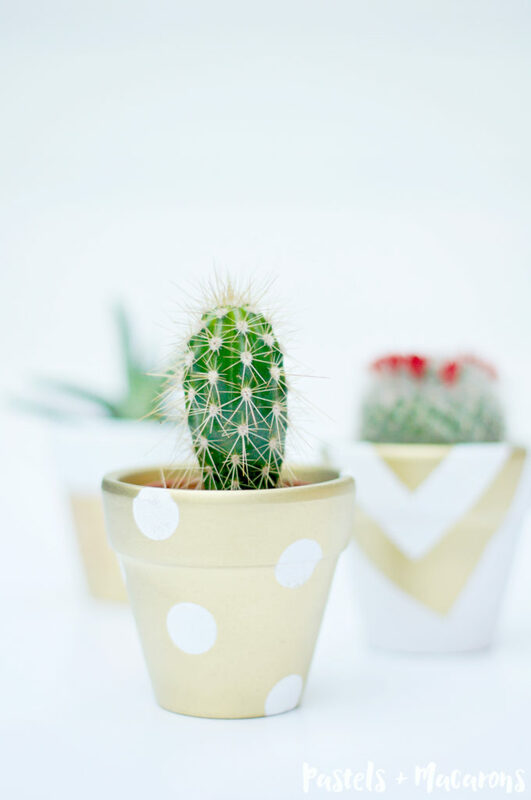 I love the little cacti. 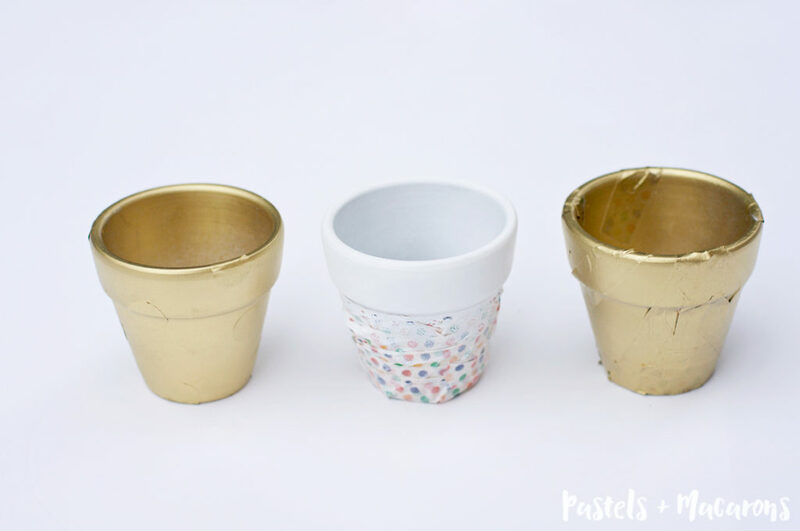 They look perfect in the gold pots! Your little pots are so pretty. I love the white and gold together, and would be so easy to do. Thanks for sharing! Thanks som much. Best thing about them is how easy there were for make! 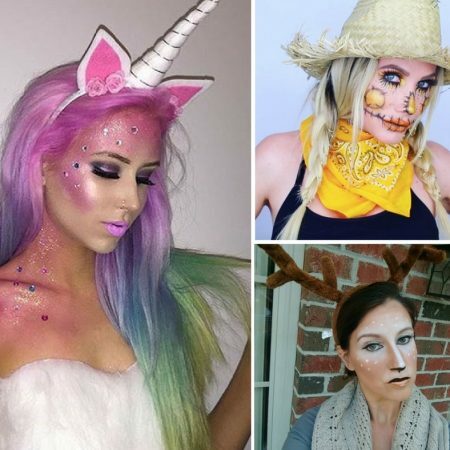 Found your post through madincrafts link party and just realised I have seen and liked many of your previous posts on Pinterest. I like the chic simplicity of these pots and can see myself doing this when I split up my jade plant. Thanks for sharing. These are adorable! The mini pots are definitely what makes them for me. Great idea 🙂 Also, thanks for including tidbits about how to spruce up a space as a renter. 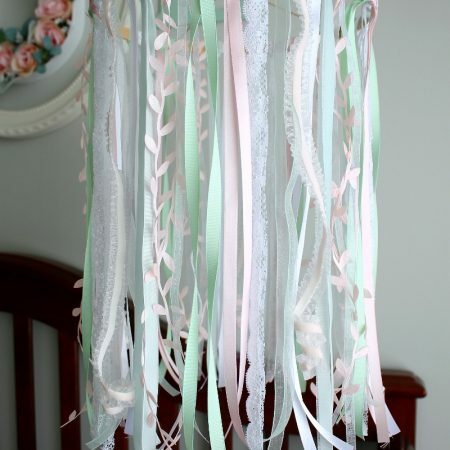 Although we are currently not renting, I think tips like that are refreshing and remind me of different ways to decorate. These are so cute! I think they’d make such cute little gifts! 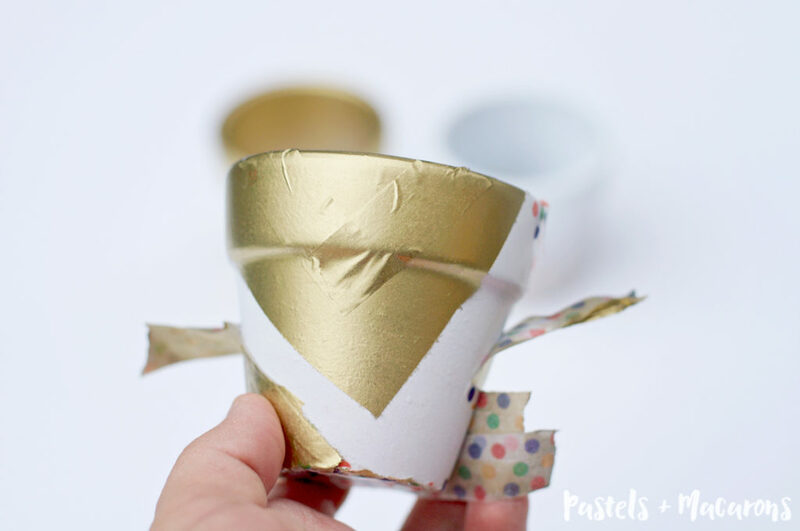 This is an easy project that definitely has the wow factor! So clever and the end result is beautiful. 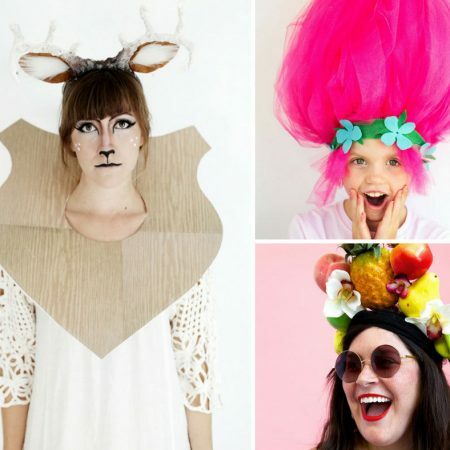 So cute and quirky. 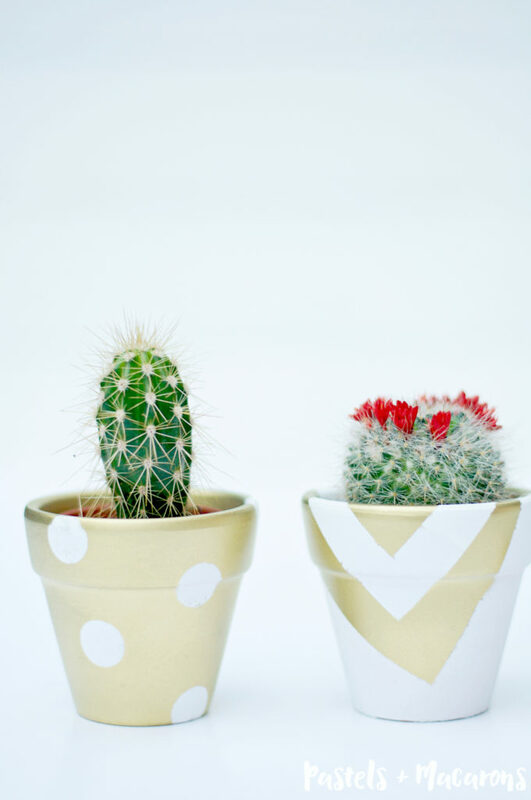 I love the dotted pots and the teeny tiny cacti! They are so sweet, and I love how you seem to have put the plants in them inside plastic pots . The painting will last so much longer of you don’t plant directly into the terracotta pots. White & gold is my fave lately! 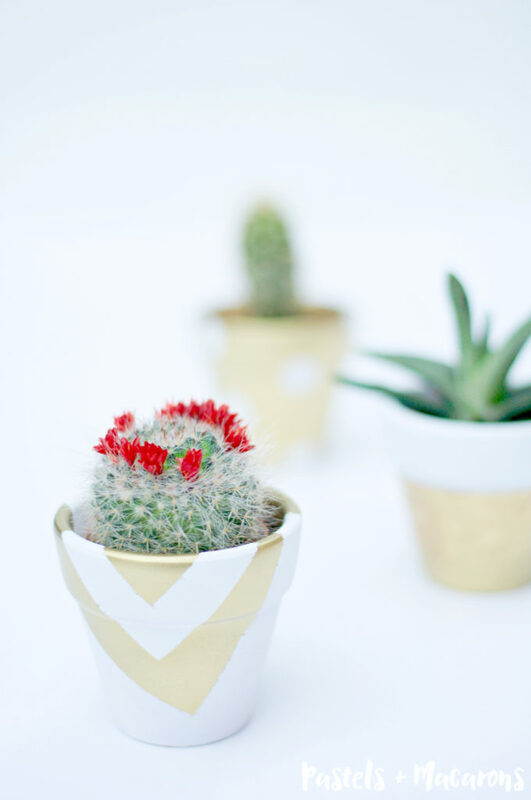 Those little pots with the succulents and cactus in them are too darn cute Maria! Will totally try your idea!!! This is so cute- I love how simple it is too! Pinning! Thanks Jessy! Thank you so much for pinning! I love this!! Very, very idea! It makes the cacti look even prettier. Would love to see you at my craft party which is new Thursdays at 7pm EST. I pin every instruction post! Have a great rest of the week! Hi Maria, I found your site from Wine’d Down Wednesday and I’m glad I did. It’s so beautiful and full of great projects. BTW my middle name is Maria. These little pots are gorgeous! Thank you so much for submitting your project to this week’s Monday Funday Party. We’re featuring your project this Sunday! 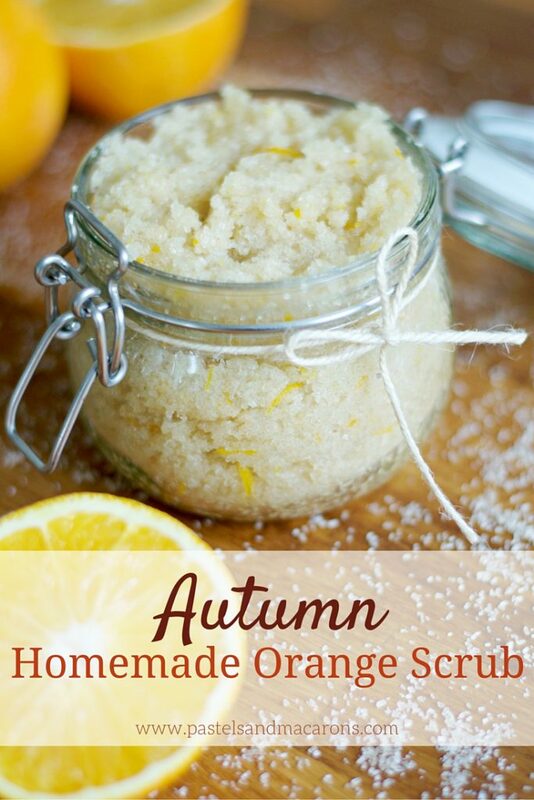 Thanks Jen and thank you so much for featuring! What cute little pots! I love how all the patterns mix together! Thank you for sharing at Dream. Create. Inspire. Link! I am pinning! I love your painted pots! 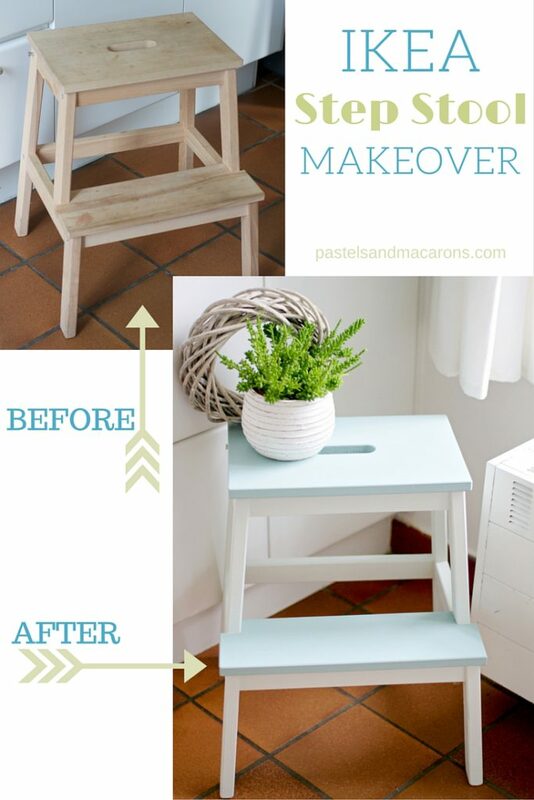 Thanks for sharing this project at Motivation Monday on Mom Home Guide! Your project is featured this week! These are so cute and look like expensive decor from the store!! And, I know I’ve told you this before, but I just love your photography! I used to be a photographer before blogging and still do shoots from time to time, so can spot well done photos a mile away and yours always catch my eye! I struggle with indoor photography of inanimate objects! It’s so much harder for me to tell a story with things that don’t have emotions or can smile back! 😉 And don’t get me started on low light and no wide angle lens… I need to pick your brain about your lighting setup! Ok, done nerding out! Thanks for sharing at Dream. Create. Inspire. Link! These are so pretty! Love them 🙂 Thanks for linking up with Merry Monday this week!